Credit Cards: Will Getting More Than One Help My Credit Score? Will More Than One Credit Card Help My Credit Score? It’s true: There’s a strong connection between how you use your credit cards and your credit score. After all, plastic provides an easy way to show that you’re responsible with borrowed money. 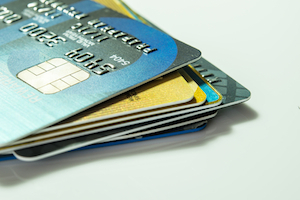 But if one card is good for your credit, are two (or more) better? The answer: not directly. For details, take a look at the information below. Using credit consistently and responsibly is the only way to build a good credit score. For most people, the easiest way to do this is to get a credit card, then use it conscientiously and make payments on time. This will add up to a lot of positive information on your credit reports, and, consequently, a high credit score. Even though adding extra credit cards to your profile won’t directly help your FICO score, there is the possibility it could provide an indirect lift. Here’s why: Your credit utilization ratio, which heavily influences the 30% of your score determined by amounts owed, is calculated by dividing the amount you owe on your cards by your overall credit limit. If it exceeds 30%, your credit score could drop. Your credit utilization ratio is calculated on each of your individual cards, and across all the cards in your name. If you’re above the 30% utilization threshold on one of your cards and you open additional plastic, but then don’t use it, you’ll be driving down your overall credit utilization ratio. In the long run, this could have a positive effect on your score, especially if you’re working to pay down your other card in the meantime. Using this strategy is tricky, though, and there are some drawbacks to consider. For one thing, opening a new card will cause your score to take a small, short-term hit. This is because getting new plastic requires a hard inquiry to your credit report, which usually results in the immediate loss of a few points. Also, every time you open a new card, you’re lowering the average age of your credit accounts. This could negatively impact the 15% of your credit score determined by the length of your credit history, especially if you have a short credit history to begin with. Finally, opening a new credit card might tempt you to overspend. Running up a big balance you can’t pay off isn’t good for your credit score or your overall financial health, so take an honest inventory of your spending habits before applying for a second card. (Also, be careful not to open too many credit cards at once. Several credit card applications in a short window of time is correlated with credit risk, and your score will drop as a result. If getting one additional card will substantially improve your credit utilization ratio, applying might be smart — but be sure to wait at least six months before you get another. Pay all your bills on time. No exceptions! Avoid using more than 30% of the credit available on each of your credit cards, at all times during the month. Review your three credit reports at least once per year for accuracy. If you spot an error, take steps to have it corrected. The takeaway: Having more than one credit card won’t directly improve your credit score. But opening a second card could give your score an indirect boost by improving your credit utilization ratio.